Rev. 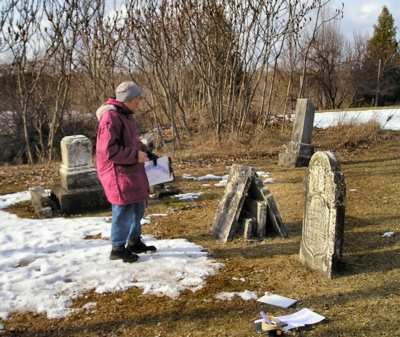 Gloria Kostyk, pictured below, combined the field notes from our survey of the cemetery in fall of 2005 with her detailed transcription of all inscriptions and her notes of the appearance and condition of each stone. It is a little more than the genealogists are used to, but since the cemetery is tiny and the inscriptions shed light on the family relationships, I have included it all here on the website. 1. A small piece of cut limestone 2 " wide x 7 3/4"long. The name "KENITH" is carved on it. This stone is located in A4, 63 1/2" to the west of the right N-S baseline in A4, and 44 1/4" north of the lower E-W grid line of A4. It appears that the name on this stone is also inscribed on the north side edge of stone no. 3 in A3, although there the spelling is different. 2. A small piece of cut limestone slightly pink in colour, on an angle adjacent to no. 1. This stone is loose, has been flat on the ground, but was setting upright on Oct. 27. It measures 2 1/4" wide x 6" long. The initials "J.K." are inscribed on it. This stone is located in A4, 56 1/2" south from the upper E-W grid line of A4, and 63'' and 60" to the west of the N-S baseline. "Lucas H. Kerr, died Jan. 22, 1912. Aged 48 yrs. His wife Daisy Dyer, 1869 - 1945." The top of the side edge facing N. reads: "Kenneth Kerr aged 1 month". A beautiful, pastoral scene surrounds Kenneth's inscription. This monument is located in Block A3, 24 1/2" south of the upper E-W grid line of A3, and 14" to the east of the left N-S grid line of A3. It is very special with lovely artwork. The base of the monument measures 24 1/2" across and 18 1/2" on the sides. This monument is in good condition but needs to be leveled. It tilts badly. "John Kerr, Died March 8, 1882, Aged 65 yrs." "Our parent here is underground, the dearest friend we ever found." There is more to this inscription, but it is also underground. There does not appear to be a base for this monument, but since this man's wife's monument has a base as in stones nos. 11 & 5, this monument probably has one. The monument is 4" thick x 19" wide, and sits 37" above ground. Located at a slight angle in B2, 55" north of the lower E-W grid line of B2, and 46" and 44" east of the left N-S grid line of B2. This monument requires cleaning and exploratory work to find the base. Should be raised and leveled. 5. This marble slab is broken towards the base and is propped together with other broken stones. The style is the same as stone no. 4. It leans towards the poplars, but is probably facing in the opposite direction from where it stood originally. The rounded, scalloped front edge reads: "Meet me in Heaven". There is a Holy Bible carved below it. "In Memory of Matilda, wife of John Kerr, Born Sept. 30, 1828, Died (the remaining inscription is submerged, but once read) Jan. 19, 1880". This monument is 3" thick, x 18 1/2" wide, x 28 1/4" above ground. It appears to belong to the base and the fragment still stuck in the base behind it, stone no. 11. Located in B2, 19 1/2" south of the upper E-W grid line of B2, and 83" and 84'' west of the right N-S grid line of B2. AGED 29 y'rs. 10 mos. ____"
This stone is 2" thick x 18 1/2" wide. Located in B2, 19" south of the upper E-W grid line, and 36 3/4" and 34 1/2" to the east of the left N-S grid line. Is part of stone no. 23. 7. Small, rough, very pointed limestone with some iron in it and many fossils -- no inscription -- may be an old grave marker. Loose on the ground, grouped with the others in B2. Measures 1 1/2" thick x 5" wide x 12'' long. 8. Chunk of sandstone (? ), 3'' thick x 11 1/2" wide x 8 1/2". Loose, grouped with others in B2. Appears not to have anything inscribed on it, but hard to tell. 9. Limestone fragment broken at bottom, slightly pink in colour. Measures 2" thick x 16 1/4" wide x 8 1/2". Loose, grouped with the others in B2. Flat, cut stone. The initials "J. S." are carved on it. Lying on its side edge on the very edge of a base which is stone no. 11. In silence all lie sleeping here. But hope in heaven to meet again. " Grouped together in B2, the base with attached lower portion of monument measures 15" across (E-W) x 23" wide (N-S). The inscribed monument portion measures 3" thick x 23" wide, and is 13" above ground. See also stone no. 5 adjacent to it in B2. Stone no. 5 and stone no. 11 may be repaired by pinning them together with steel dowels and gluing them with epoxy. The repaired monument would then match John Kerr's monument next to it, stone no. 4 on the "Existing Conditions Plan" and in the field notes. Located in B2. 12. Small, irregular, rounded limestone with no inscription. Measures 3" thick x 8" wide x 5" high above ground. 13. Cement base. Measures 20" long x 19" wide. Located 20 1/2" and 21" north of the lower E-W grid line of B3. 14. Cement base. Measures 17 1/4" across x 11 1/4" wide. Located 90'' and 91" to the west of the right N-S grid line of B3, and about 53" north of the lower E-W grid line of B3. 15. Small, flat, smooth cut, rectangular limestone, slightly orange in colour. Wonder whether there are initials on the underside. Has another stone (no. 16) in a base on top of it. Measures 8 1/4" wide x 11 1/2" long. Located 86" and 88" to the west of the right N-S grid line of B3. 16. Small monument, perhaps marble, in attached base, in a style like nos. 4 and 5. It is setting askew on top of no. 15. Has scalloped top. Cannot read the top front. "Joseph Kerr, Born Jan. 20, 1861. Died May 30, 1861". 17. Small, submerged marble or limestone monument or fragment with faded inscription lying next to the Stanton family monument, no. 20 in B3. Measures 16 1/2" wide by 17" long. (Might belong to an empty base.) The word "baby" may be deciphered in the lengthy inscription. The top of this monument is broken off, so a name does not appear on it, however, there is a partial date: "Died Sept. 29, 18__. Located in B3. 18. Two small, very worn limestone or marble pieces probably broken, but might be just cracked, since they fit together. The inscription is indecipherable. The two worn pieces measure 15" across. Located 19 " to the east of the left N-S grid line of B3. 20. Large Stanton family monument with inscriptions on all four sides. The base appears to be sandstone. The monument itself is marble with a small steel dowel protruding from the top where the marble pillar has broken off from it. The square base measures 26" x 26". The left N-S grid line runs approximately through the center of this monument. The right side of the monument's base is located 15" and 15 1/2" to the east of the left N-S grid line of B3 The other half of this monument extends into C3. Some inscriptions on this stone are clear, others are dirty and almost indecipherable. The monument will have to be cleaned and repaired with the pillars set on top. Each side of this family monument contains inscriptions. "James Stanton - Died March 7, 1881, Aged 86 y'rs. Also his wife - Sarah Ann - Died July 31, 1872, Aged 64 y'rs." "Mary - Born March 28, 1841 - Died June 27, 1843." "William, Born Feb. 26, 1830. Died Nov. 1830." "George F. Stanton - Born July 18, 1843. Died April 28, 1874." This family monument requires some leveling. 21. Lower portion of broken marble pillar for Stanton family monument. This tapering column should sit on top of stone no. 20. It measures approximately 7 1/2" at widest part, tapering to 6", and is 29" tall. Located in C3, 42" north of the lower E-W grid line, and 17" to the west of the right N-S grid line of C3. 22. Upper portion of broken marble pillar which is broken off from no. 21. This tapering column measures 6" square at widest part, tapering to 5 1/2", and is 18 3/4" tall. Located 45 3/4" north of the lower E-W grid line of C3, and 25 1/2" to the west of the right N-S grid line in C3. From you a Father, Christ doth call. The inscription has remained well preserved underground. This piece with the base would seem to be the lower portion of stone no. 6, belonging to John Stanton who died on June 19, 1863. 24. Narrow, upright, pillar type granite (quartz & sandstone ? ), grey coloured monument nearest the road. In good condition, but base is covered with a rare golden moss only native to this area. Lovely, artistic designs appear on the base, but are mostly obscured by the moss/lichens. "Edward Kerr, Died Sep. 29, 1911, Aged 75 yrs." "Sarah Ann Stanton, Wife of Edward Kerr, Died Aug. 4, 1892. Aged 54 yrs. 4 mos." This monument requires cleaning and leveling. It measures 18'' x 18" at the base. Is located in C1, 24 1/2" south of the upper E-W grid line of C1, and 23 3/4" and 23 1/4" to the east of the left N-S grid line of C1. 25. Small, submerged stone of marbleized limestone. (May be a foot stone for a grave close to the Stanton family monument.) No visible inscription . Measures 2" thick x 8 1/2" long. Located in C3, 34" north of the lower E-W grid line of C3, and 50 1/2" and 50 3/4" to the east of the left N-S grid line of C3. 26. Small stone, almost submerged, marbleized limestone, smooth, weathered rectangle, slightly pink in colour in places. Has the initials "GFS" carved on it close to the top. May be a foot stone for George F. (Francis) Stanton, whose name appears on the Stanton family monument. Measures 2" thick x 8 3/4" wide. Located in C4, 38" north of the lower E-W grid line of C4, and 55" and 56" to the east of the left N-S grid line of C4. 27. Small, submerged stone, similar to no. 26. May be important if lifted and seen. Measures 2" thick x 7" across. Located in lower left corner of C4, 3" north of the lower E-W grid line of C4, and 1 1/2" to the east of the left N-S grid line of C4. 29. Very small, almost square, smooth, cut limestone. Loose on ground. On one side are carved the initials: "J.S.". Measures 2" thick x 6 1/2" wide x 7" across. Located in E2, 51" to the west of the right N-S grid line in E2, and 58" north of the lower E-W grid line of E2. 30. Large, pink/red granite monument with the base containing some mica (?). Polished one side. Standing near the poplars in E3. Measures 16 1/2" wide x 30" across. Located 4" to the west of the right N-S grid line of E3, and 45 1/2" north of the lower E-W grid line of E3. "James Stanton 1835 - 1909"
"His wife - Harriet Bass 1865 - "
This monument is in good condition. Only some cleaning is required. 31. This stone is an irregular, dark, uneven fieldstone slab. It measures 2+" thick x 14" across. It appears to mark the former grave of George Kerr and lies a grave length opposite stone no. 28, with a slight depression between them. It is located just outside the left N-S grid line of D4, and 7" north of the lower E-W grid line of E4. While this stone lies in E4, it is referenced in the field notes of D4. 32. Small, broken piece of almost triangular shaped limestone lying between the two empty bases, nos. 13 and 14, close to the Stanton family monument, and nearly touching stones nos. 14 and 17. The stone is cut and might be a piece from the submerged stones adjacent to it. Located in B3. It measures 7 1/2" x 8".